The American League Wild Card Game is here again and so is the posting of the umpire review. This is sometimes an exercise in futility given there is only one umpire whose strike zone we have to focus on, but given the fact that umpires in the Wild Card Game are likely to appear later in the postseason, it will be useful anyway. So, without further ado, here are the six umpires that will be officiating the game between Oakland and New York. The older brother of former journeyman pitcher Randy Wolf, the 48-year-old Jim Wolf is our home plate umpire for the game. Jim Wolf’s strike zone is the definition of a hitters’ umpire. The statistical analysis of his strike zone backs it up. In 32 games behind the plate, Wolf’s ERA is 4.48, tied with Todd Tichenor for 14th highest in baseball this season. The strike zone Wolf has leads to 9.1 hits per 9 innings, 3.3 walks per 9 innings and 8.3 strikeouts per 9 innings. The 8.3 is extremely low for most umpires. (There are lower, such as Tom Woodring with 8.1 and Ben May with 8.0.) Batters have a .262/.331/.422 batting line with Wolf behind the plate and those numbers match a hitters ump. Wolf, a native of West Hills, California, made his MLB debut on September 2, 1999 working as part of a National League crew featuring Phil Cuzzi, Alfonso Marquez, and Brian Gorman. Wolf umpired a game at 3rd base between the San Francisco Giants and the Philadelphia Phillies at one of the last games at Candlestick Park for baseball. Wolf has something unusual: no ejections this season. In fact, he has never ejected a Yankee. If there is a rare heave ho in a Wild Card, the Yankees are not getting it from Wolf. Greg Gibson is the first base umpire in the Wild Card Game. This might likely be his last postseason in baseball as all signs point to him retiring after the 2018 season. He is about to hit the pension level of 20 years in umpiring and already runs a State Farm branch in Kentucky. Gibson’s strike zone is pretty average, with a 4.04 ERA in 31 games behind the plate. That is tied for 52nd with Ryan Blakney. Batters have a 8.7/H9, 3.0/BB9 and 7.9/K9 (really small and low) batting line. Batters only have a .254/.320/.420 batting line, which is average, leaning towards hitters. The native of Ironton, Ohio made his major league debut on June 14, 1997 at the old Busch Stadium in St. Louis in an interleague game between the Cardinals and the Indians. He was part of Paul Runge’s crew, with Brian Gibbons and Paul Schreiber. Gibson has 81 career ejections since his MLB debut, none of which were against the New York Yankees. Gibson has four ejections this year (Brandon Hyde, Brandon Belt, Juan Soto and Kevin Long). If this is his last go around, props to a wonderful career for Greg Gibson. Gerry Davis is the crew chief, and until Tuesday afternoon, there was no one announced otherwise. 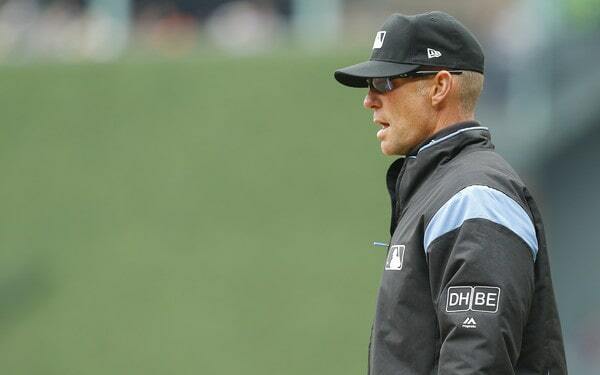 An umpire and sports gear aficionado, Davis is one of the most veteran members of the game of baseball. Behind only Joe West in tenure, Davis has served as an umpire for 37 seasons. Davis worked 28 games behind the plate for the 2018 season, and he has a 4.21 ERA for the season. That is good enough for 37th of 89 umpires. His numbers though, lean toward the hitter. Scouting reports note he has one of the smallest strike zones in the game of baseball. The numbers are in some agreement of that. Batters have a 8.0/H9, 3.2/BB9 (high) and 8.4/K9 line with .236/.307/.407. The on-base percentage will be high with Davis behind the plate.
? The native of St. Louis, Missouri, Davis now lives out in the western United States. He made his MLB debut on June 9, 1982 at Olympic Stadium as part of the late Frank Pulli’s crew, which included Jerry Crawford and Sicily-native Nick Colosi. Davis has 85 career ejections, including two this season. However, his most famous Yankee ejection came on April 23, 2014 when he tossed Michael Pineda for the pine tar on his neck. He also is the one who ejected Adrian Beltre for moving the on-deck circle, which showed up the umpire. Humorously, his next to ejections were of Joe Girardi in August 2014 and Bob Melvin that same month. Davis is one of my favourite umpires in the game. Hopefully he has an ALCS assignment. Alan Porter is our third base umpire in the Wild Card Game. Yay, more hitters umpires. If this were the American League Division Series, we would be in business with hitters zones. If Wolf’s strike zone wasn’t small enough, Porter has an 8.4/H9, 3.2/BB9 and 8.7/K9 strike zone. Do not expect much of a strike zone of questionable calls. Batters have a .247/.318/.434 batting line this season with Porter behind the plate in 30 games. That is an excellent hitters line, especially in the on-base percentage. The native of Chestnut Hill, Philadelphia made his MLB debut on April 5, 2010 at PNC Park in a game between the Pirates and the Dodgers. That game he worked under John Hirschbeck’s crew, with Larry Vanover and Mark Carlson. Andrew McCutchen was in that game. Porter has 26 major league ejections in his short career, with four this season alone. Two are of the Yankees, one of which was this year. This year, he ejected Josh Bard on April 27 after a questionable strike three call. In 2015, he also ejected Joe Girardi for a check swing call. Five for five in average or hitters umpires. Will Little is the left field umpire for the Wild Card Game. Literally right above Gerry Davis in ERA (4.22) and a 1.30 WHIP, Little is another hitters specialty. Batters with Little behind the plate have an 8.5/H9, 3.2/BB9 and 8.4/K9 line. Hitters are batting .246/.312/.400 with Little behind the plate. Again, great numbers if this were a full series rather than just one game. However, the heave-ho would be an accurate description of Will Little. He made his MLB debut on June 24, 2013 in a game between the Cleveland Indians and Baltimore Orioles as part of Ted Barrett’s crew. A native of Fall Branch, Tennessee, Little has racked up 29 ejections in six seasons, including eight this season. 28 of the 29 ejections are over balls and strikes or a check swing. The only one that has not been for that was ejecting Mike Matheny on August 1, 2014 for a balk call. The irony is that most of the calls in 2018 were correctly called. Well, we get 6 for 6 for umpires whose strike zones tend to favour hitters. Pat Hoberg is our right field umpire in the Wild Card Game, which is his first postseason assignment. (We may have Gibson in his last and have Hoberg in his first.) Batters have a 4.21 ERA (tied with Gerry Davis and John Tumpane) and a 1.32 WHIP with Hoberg behind the plate. The strike zone definition here is: miniscule. Batters have an 8.3/H9, 3.6/BB9 (!!!) and an 8.1/K9 rate. That strike zone is small. Really small. Batters have a .243/.317/.406 batting line, which backs it up.
? The native of Des Moines, Iowa made his MLB debut on March 31, 2014 at Chase Field in a barn burner between the San Francisco Giants and the Arizona Diamondbacks as part of Tom Hallion’s crew. He has 16 career ejections, including 3 this year. He got some unintended airtime for ejecting Seth Maness, Yadier Molina and Mike Matheny in back to back games. No one was happy with him. The Yankees should remember Hoberg, he was the man who gave Aaron Boone his first ejection of the 2018 season and as Yankee manager. (For those wondering, Boone’s last ejection was in June 2007 for fighting.) Hoberg worked as part of Davis’ crew during the regular season, so no surprise they are together again. Well, as I have repeated again and again, the Yankees would in the benefit of not one, not two, but six strike zones that all favour hitters if this were a full postseason. Hopefully if they advance, we get to see some of them again. If they do advance, Angel Hernandez awaits in Boston.